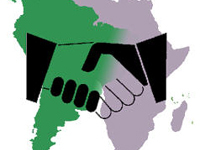 Brothers come together – Latin America approaches Africa as a friendly space for investment. For the Africans, investment from Latin America will not have the political charge which frequently accompanies programmes from the countries which for centuries carved up the continent into parts which they themselves dominated, without any regard for its citizens, while they ransacked its resources. delegates from the 53 African and 12 South American countries, showing the great importance of the event at a time in which bilateral links are expanding rapidly: between 2002 and 2006, the volume of trade between Brazil and Africa rose from 5 to 15 bn. USD per year and in 2005/6, Vnezuela doubled the number of diplomatic missions in Africa, today having representations in 47 of its 53 countries. The Organization of the Summit described it as “an initial summit to explore ways to solidify the agreements joining the two continents”. On the agenda were questions related with peace and security, investment, energy, natural resources, the agricultural sector and cooperation, in general. The Final Declaration mentioned the plans to boost greater cooperation between the African Union and the South American Community of Nations in the economic sector, but also to enlarge cooperation to the political and cultural areas. Among plans to stimulate South-South cooperation are the setting up of an Africa-South America Bank and the adoption of common positions in the WTO. The Declaration also created the Abuja Resolution, which is to set up a Forum for Cooperation, based in Nigéria and meeting once every two years to debate bilateral relations. It was also decided that the Second Africa-South America Summit will take place in Caracas, Venezuela, in 2009.